Bowl feeders are designed to use either vibration or the rotation of a disc to feed and orient product to a different application or to a conveyor line. A bowl feeder that uses the vibration of the bowl to feed product is often referred to as a vibratory bowl feeder. 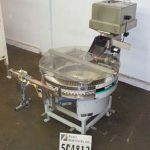 A bowl feed that uses a rotating disc to feed product is often referred to as a rigid disc or rotary disc feeder. Bowl feeders are designed with different diameters. The diameter of the bowl feeders necessary for a particular application is dependent on the size of the product being fed and on the speed at which the product needs to be fed. (Large products require larger bowl feeders, and faster feeding speed also require larger bowl feeders.) Bowl feeders are designed to have an amount of product in the center of the bowl. Often, a bowl feeder is integrated to a incline cleated feeder that senses the level of the product in the bowl and feeds additional product into the center of the bowl feeder as the amount of product drops below a certain level in the center of the bowl feeder. (See Feeder / Incline Cleated for more information.) The bowl feeder will feed the product to the outer circumference of the bowl feeder with either vibration or a rotating disc. A series of plows around the outer circumference of the bowl feeder are designed to orient the product being fed to the proper orientations. 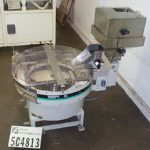 Vibratory bowl feeders are designed to vibrate the entirety of the bowl. As the vibratory bowl feeder vibrates, product is carried out from the center of the bowl and up small circular inclines around the outer circumference of the bowl. As the vibratory bowl feed continues to vibrate, the product moves along the circular incline tracks and eventually gets to a point where the product is discharge tangentially from the vibratory bowl feeder. Plows along the incline tracks that carry the product are designed to drop product that is not properly oriented back into the center of the bowl. Rigid disc bowl feeders are designed with a rotating center disc. As the disc rotates, the centrifugal force of the rotating disc causes the product in the center of the bowl feeder to move towards the outside of the rotating disc. At one point along the rotating discâ€™s path, the product gets transferred to a track around the rotating disc. The product is fed around the track of the rigid disc bowl feeder. A number of plows along this track are designed to knock improperly oriented product back into the center of the bowl. The product travels along the track to a point where the product is tangentially discharged from the rigid disc bowl feeder. 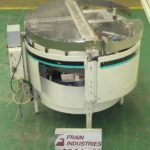 Automatic Horizontal 38" Diameter S/S Centrifugal Feeder With Sort/Feed Capacity Of 150 Pcs/Min. Will Run Caps, Scoops, Etc W/ Nominal Dimens Of 2" X 1.5". Item Oriented By Longitude Before Dropping In Container. Air Assists In Sorter And Chute Prevent Jams. Unit Has Photoelectric Pneumatic Control And Sorter Operation. Complete With 60"L S/S Chute. Last Used Feeding Scoops Into 4" Diam Soft Drink Mix Containers. Cap Sorter Is Currently Set For 33mm Sequist Cap, Capable Of Speeds Up To 200-250 Cpm. Hopper Size Is 2 1/2 Cubic Feet. Sorter Is Mounted On A Rotary Base For Various Cap Discharge Direction. Was Last Used In Conjunction With A Capem C4fa Capper. 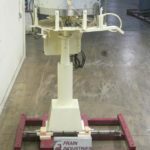 40" diameter vibratory bowl equipped with a 1"W x 1"H discharge chute discharging at 36"H. Also features a vibratory cleated incline feeder equipped with a 120"L x 6-1/2"W S/S belt, 3"L x 6"W x 6"H cleats, a 38"L x 30"W x 26"D S/S hopper and a discharge height of 120". Unscrambler is mounted on a steel platform 96"L x 96"W with rails. Last running in conjunction wiht 16 head consolidated capper. 50" diameter, rotary, tangential, centrifugal feeder. 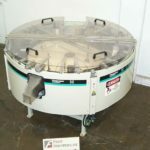 Has adjustable discharge up to 3" wide, rigid plastic feed disc, half-open flip top lexan cover, 96"L x 1"W belt conveyor discharge, and 3/4 hp drive motor, Mounted on casters and set down feet. 40” Diameter, centrifugal feeder, FS series feeder is a scallop style designed to orient bottles, and other shaped containers. Currently set with approximately 2 1/2 W x 4" L pockets. flip top cover barrier guarding, with a discharge height of 34". Has push button start / stop, jam re-set and e-stop. Last running stick deodorant containers in a cosmetic operation. Centrifugal bowl feeder capable of speeds up to 2000 parts per minute dependent on part size, shape and feed characteristics. Complete with a SCR-controlled variable speed drive, 48" diameter bowl with 25 cuft capacity, leveling legs and painted steel base. (OAD: 81"L x 85"W x 69"H). Centrifugal Container Feeder System orients and delivers containers at a rate of 20 to 2000 parts per minute- determined by part size, shape and feed characteristics. Capable of feeding from plastic caps to prewrapped candy. Includes optional RC 800 -approx. 6 CuFt stainless steel prefeeder hopper with a motor driven belt feeding into the centrifugal feeder. 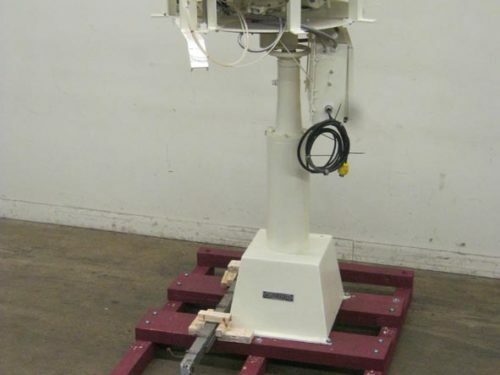 A level sensor mounted inside the Hoppmann feeder turns the prefeeder off when necessary to avoid overloading the Hoppmann feeder with "parts".. Once in the feeder, "parts" move from the center of the feeder up onto scallops where they are singulated and qualified they then exit the feeder. Unlike vibratory feeders, the centrifugal feeder operates best when relatively few containers are in the feeder at any given time. Includes optional hinged interlocking guarding and levelers. FS or Feeder Scalloped is generally tooling used to feed bottles. CRS/Cold Rolled Steel construction. Centrifugal Container Feeder System orients and delivers containers at a rate of 20 to 2000 parts per minute- determined by part size, shape and feed characteristics. Capable of feeding from plastic caps to prewrapped candy. A level sensor mounted inside the Hoppmann feeder turns the prefeeder off when necessary to avoid overloading the Hoppmann feeder with "parts". 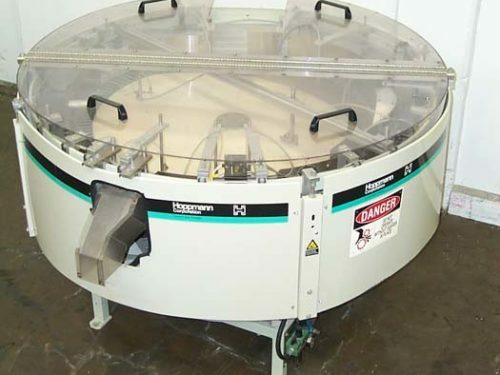 30" Centrifugal bowl orients and delivers containers, caps, etc., at a rate to 2000 parts per minute- determined by part size, shape and feed characteristics. Includes optional 6 CuFt stainless steel pre-feeder hopper with level sensor. Centrifugal Feeder Is Capable Of Speeds Up To 2000 Parts Per Minute dependent on part size, shape and feed characteristics. Unit Has 4′ Diameter Bowl 25 Cu Ft Capacity. Equipped with SCR-controlled variable speed drive, leveling legs, stainless steel tooling, lexan and stainless guards.cover. System Dimensions: Top Ring Diameter is 72", Bottom shell diameter is 50". Other Applications Range From Spark Plugs, Fuses, Dip Sockets, And Bearings To Sponges, Candy, Caps, And Lamp Bulbs. OAD: 6’6"Dia x 4’H.